The Yankees came into this series at near rock-bottom. They’d just lost two out of three to the Reds and fallen to just one game over .500, they’re worst record since pretty much the first week of the season. They were at home against one of the worst teams in baseball (although a team with a very good young core of players), and they needed to show somebody… anybody… who was boss. If you’ve watched the Yankees over the last few weeks, you knew that wouldn’t be easy, but the got it done, beating the Royals two out of three. This game was an unmitigated disaster petty much from the get go. The Yankees were couldn’t score a run off of Felipe Paulino in his 6.2 innings, bringing their total against him this year to no runs in 12.2 innings. Note to the AL East: if you’re looking for someone to help you beat the Yankees, Felipe is your man. They have no idea what to do when he’s pitching, unlike the rest of the league over his short career. The Yankees ended up losing this game 6-0, and they went 0-13 with runners in scoring position. 0-13! No hits in thirteen at bats with a chance to get on the board. It was pathetic. I can’t really blame this loss on Kuroda. I’m starting to wonder what the starting rotation’s motivation is supposed to be, when the game is over if they give up two runs. If you give up two, you might as well give up 50. The Yankees offense has been that bad. That being said, Kuroda wasn’t great in this game, but he did enough to win the game, because this Yankees offense shouldn’t be scoring any less than four or five runs per game. Hiroki gave up a two-run home run to Mike Moustakas that somehow hit off the foul side of the foul pole. In any other stadium, except maybe fenway, that’s a foul ball. I’m not going to say the Yankees haven’t deserved the losses they’ve had this season, but they’ve had some really terrible luck. Every hard hit ball seems to find a glove, and every mistake pitch seems to find the seats. That’s baseball, Suzyn. Kuroda’s final line was respectable enough: 5.1 innings, 7 hits, 3 runs, 3 BBs, 4 Ks… but you can’t win without runs. Either way, the Yankees need Kuroda to be the guy they paid $10MM for, and they need it soon. As I mentioned earlier, the Yankees were held scoreless in this game despite having 13 at bats with men in scoring position. The highlight of the night was when they had the bases loaded with nobody out in the bottom of the third and didn’t score. Martin led off the inning with a single, which was followed by a very hard-hit single by Jeter and a walk to Granderson. That meant the 3-4-5 hitters were coming up with a chance to break the game wide open. Cano struck out looking, A-Rod struck out swinging and Ibañez almost hit a grand slam, or a bases clearing double, but the ball found a glove in left-center. The pitch to Canó was a little outside, but at this point that is no longer a viable excuse. Get a hit. Anyone. Is there a worse usage of a roster spot right now than having Freddy García in the bullpen? Even when he was pitching well in this role, with some solid mop up innings in the recent weeks, do we really need him in there? Isn’t that what Cody Eppley or David Phelps are for? The García problem is tolerable when he’s pitching well, but when he comes in and gets smacked around by the royals (2.1 innings, 5 hits, 2 runs, 1 HR), it really makes you wonder just what the hell Girardi and Cashman are doing. DeWayne Wise has pretty much become the starting left-fielder of late. He’s hitting under .150. You’re telling me that roster spot, the twelfth pitcher who only comes in in games where the Yankees know they’re not gonna win or lose, is more valuable than another bat on the bench? I’m sorry, but Freddy is obsolete on this team. The Yankees should cut him loose and let him go play somewhere else. I’ll be honest with you readers. I listened to the top of the first inning (it was on in the car on the way home from the train station), and I watched one batter in the top of the eighth. That’s it. It wasn’t because I was busy at a family function (although we did have a small family dinner for my dad’s birthday). I wouldn’t have watched this game if you paid me. I didn’t feel like sitting through another frustrating game. While the Yankees did win this game, I don’t think I would have been too happy watching this anyway. It’s official, friends. Phil Hughes has turned his season around. He continues to go out there and get outs. He’s still using way too many pitches (106 in his six innings in game two) but he’s racking up the ground ball outs (6 in this game) and strike outs (7), and not letting innings get out of hand. In his last inning, Hughes let the Royals load the bases with a single and a couple of walks, but ended up getting Irving Falu to fly out to end it. Earlier in the season, that inning would have gotten ugly. Actually, it would have gotten ugly and happened in the top of the first. He did allow another home run (to Francoeur), but it’s nice to see a four before the period on Hughes’ ERA, and I can’t wait to see it keep dropping. His final line: 6 Ip, 5 H, 2 R, 2 BB, 7 K, 106 pitches. Good job, Phil. The Yankees only scored three runs in this game. They only went 2-7 with RISP. They didn’t convert on a bases loaded, one out situation. These things all sit better in my stomach when they get the win, but it’s still not good. The Yankees should probably have pounded Luke Hochevar in this game (they did last time). He’s not good, and he’s a familiar arm to them. Instead, they managed only a solo home run by Canó (his first non-grand slam off of Hochevar out of three total home runs), an RBI single by Jeter, and an RBI groundout by Granderson. They really missed an opportunity to break this game wide open in the bottom of the fifth, when they had their game-winning “rally.Tex opened up the inning with a single and went to second on an error by Francoeur, and Martin was hit by a pitch. DeWayne Wise went up there to sacrifice, but laid down a perfect bunt for a single. The bases were loaded with nobody out. Again. This time, Jeter dunked a soft line drive to right for a run, and Granderson grounded to first to plate another. 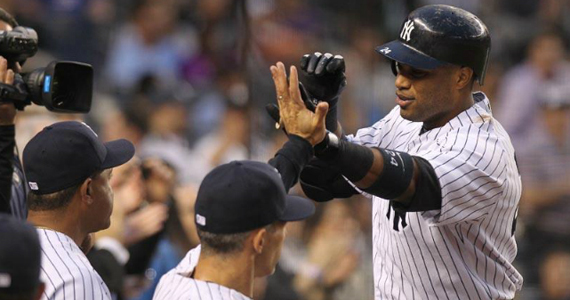 After an intentional walk to Canó, the Yankees still had the bases loaded with only one out. Instead of capitalizing and giving the fans some offense to cheer about for the first time in what seems like a month, A-Rod and Ibañez struck out. Rally over, LOBs everywhere. A-Rod couldn’t even get one of his now world famous singles in that situation? Come on, playa. Anyway, I don’t want to complain too much about a win, so I will end it there. The familiar theme for this game three was that the Yankees were knotted up in the series and needed a win so that they could say they won a series. Any series. It’s been a pretty lean month for the Yankees. They entered this game with a 9-12 record for the month, and losers of six of their last eight. If you listen to the Yankees talk, they just need things to come together in one game, and this will get them on the roll they need in order to get back into contention in the AL East. Would May 23rd be the day the Yankees turned their season around? The Yankees were facing a rookie named Will Smith in this game (yes this is where you laugh at the headline). Smith was making his major league debut, which usually spells doom for the Yankees bats. They are the kings of getting shut out by pitchers they’ve never faced before. Fortunately for me, and the mood of this post, the Yankees actually got off to a pretty hot start. After Jeter grounded out to start things off, Granderson missed a bunt attempt on a 1-1 pitch. It’s a good thing he did, because he got a hanging breaking ball on the next pitch and smacked into the seats for a solo home run. After a walk to Teixeira, A-Rod got a 2-2 fastball in and hit it into the seats in left to give the Yankees a 3-0 lead. It was the kind of start Yankees fans had been looking for for a few weeks, but the Yankees weren’t done. Jeter doubled and went to third on a single by Granderson to start the bottom of the third. He scored on a double play grounder by Teixeira, which was a little lame because it killed a potential rally, but A-Rod followed that with another home run, this one a towering shot to left-center. It was A-Rod’s first multi-home run game since May 17th of last season, and it chased Will Smith faster than a couple of guys being up to no good and making trouble in the neighborhood. Bienvenido a AAA, Will. The Yankees scored three more runs in the bottom of the fifth, on one of the worst rallies I’ve ever seen in my life. Nix was hit by a pitch to start the inning. Jeter followed with a bunt single, and Granderson walked to load them up. 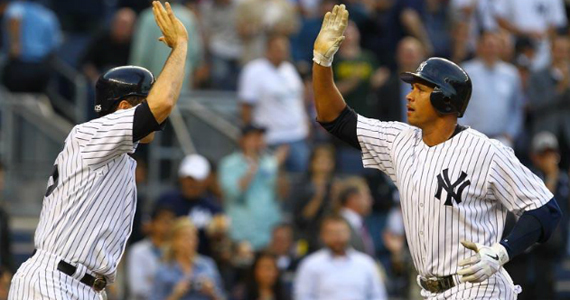 Teixeira walked to score Nix, and A-Rod grounded into a force-out at home for the first out. Canó hammered a one-hopper up the middle, but Alcides Escobar made a brilliant diving stop on the ball to get the out at second, allowing a run to score. Swisher was then hit by a pitch to re-load the bases, and Andruw Jones walked to score Teixeira and make it an 8-2 game. Russell Martin then flew out to center to end the inning. That’s right. Three walks, two HBP and a bunt single. Nice rally. We’ll take it. His last time out, Andy pitched eight scoreless innings in a one run game that the Yankees needed desperately to win. I wouldn’t say he was as dominant in this game against the Royals, but he didn’t really need to be. The Crafty Lefty got some run support early and really only made a couple of bad pitches in this game. 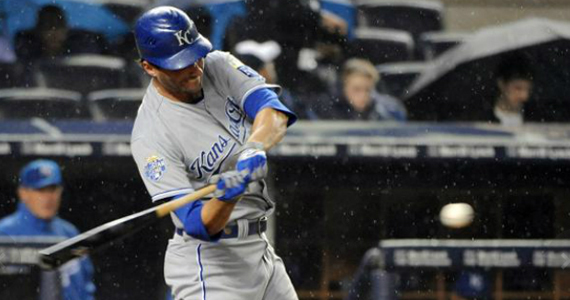 The first was a 1-1 changeup that he left right over the plate to Billy Butler, who hit an opposite field home run. The other was a 1-0 fastball that Mitch Maier pulled over the short porch in right. When the home runs are of the solo variety, and the offense scores a bunch of runs, that’s ok. The rest of the game, Andy kept the Royals off balance and actually generated a lot of swings and misses, racking up eight strike out over his seven innings of work. Andy has 17 strikeouts in his last 15 innings, and he’s not using mid-90s heat to get them. 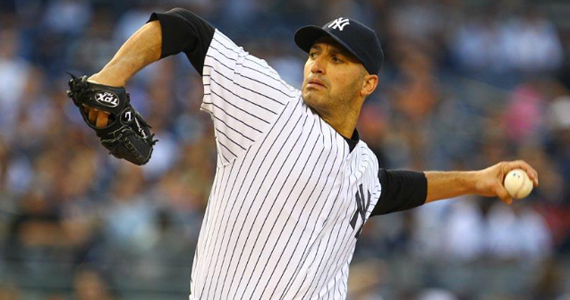 He’s putting on the Andy Pettitte pitching clinics of old, and it’s a lot of fun to watch. His final line: 7+ IP, 7 H, 2 R, 1 BB, 8 Ks, 97 pitches, and he’s now 2-1.